This is my version of a St. Patrick’s Day table setting. 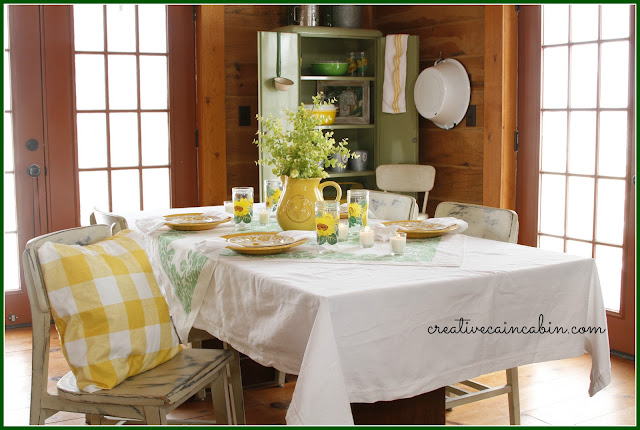 I looked around the house and found all the things that fit into the green and yellow theme I was going for, and if I found it in a vintage item, better yet! Now if only I can find that pot of gold at the end of the rainbow. Happy St. Patrick’s Day everyone! You have such a great cabin, I love it. I just found your site through a link party and have spent an hour going through it. Thanks for sharing. Beautiful Dawn!! 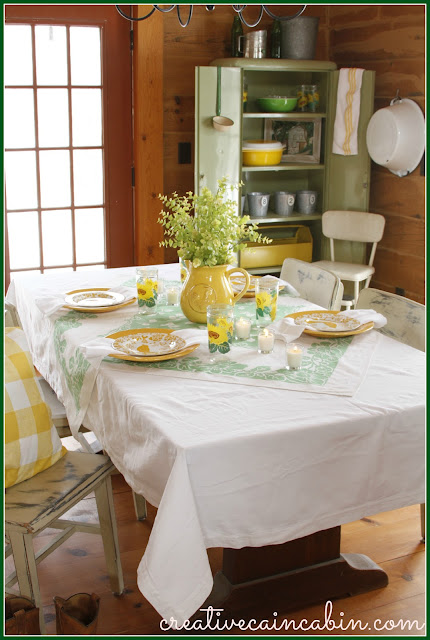 I love the layered table cloths and the bright pops of yellow are perfect! Cute rooster pitcher too! Oh how pretty! 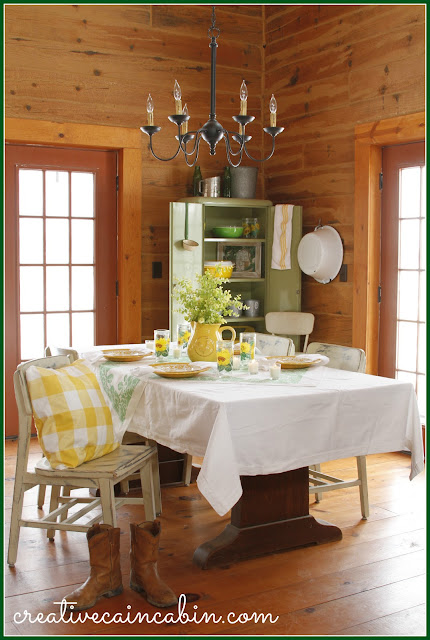 I love the green and yellow combination – so fresh! 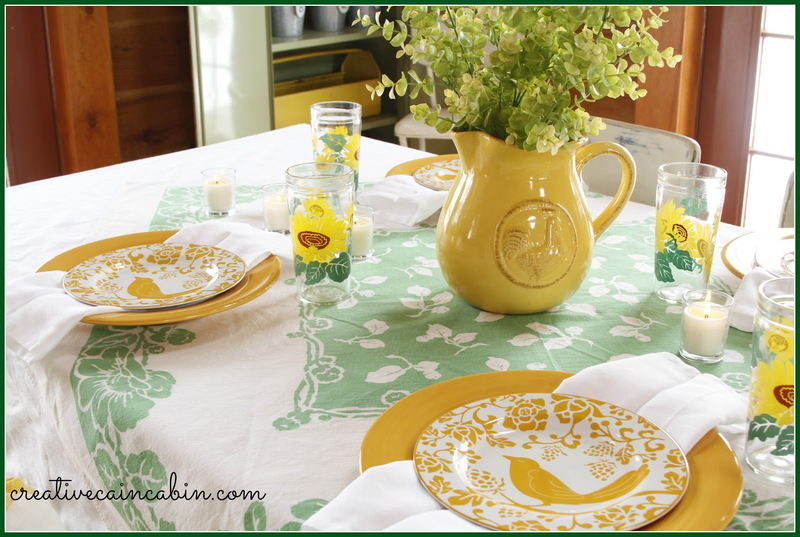 And those birdie plates are darling! I always love seeing your rooms. Each one is so inviting and bright and cheery. I always think of a beautiful vacation home when I see your pictures. I love the yellow and white checks. What is it about checks they are always so pretty and eye catching. 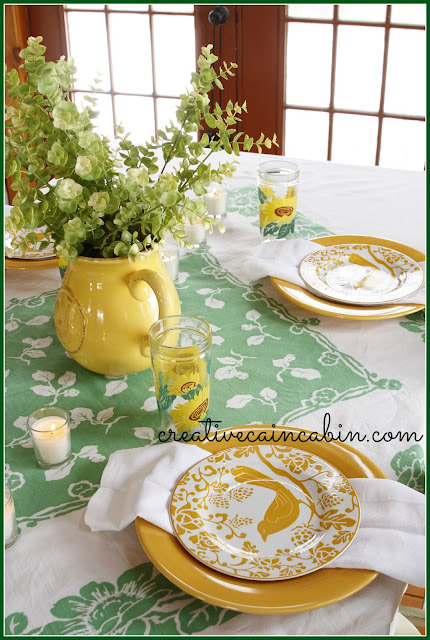 I love those bird plates oh my those are so pretty and so whimsy for the table setting. Love it all. super cute, love your birdie plates! So cheerful and happy! 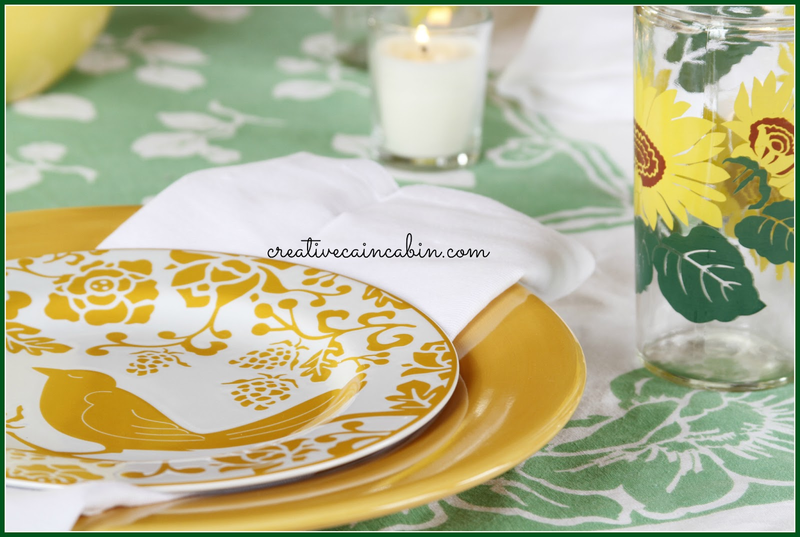 I love it and green and yellow are perfect for these early spring says! Your setting looks so pretty and colorful! 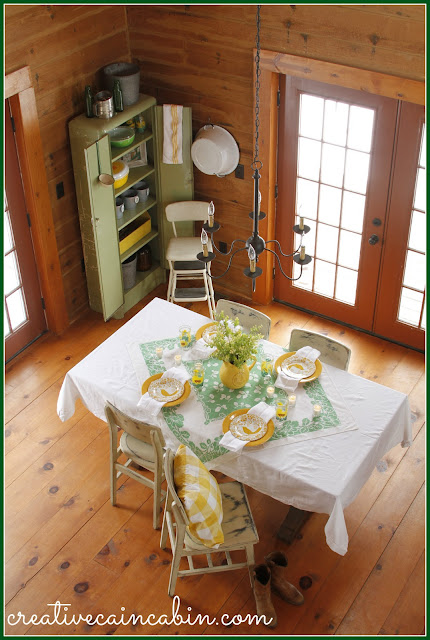 It looks especially nice with your beautiful woodwork! Your table looks so pretty, and colorful!! Love your table setting and those plates with the bird design are so cute!! Your green and yellow looks so pretty and cheerful. Seeing your home makes me want to go to Gatlinburg which is my favorite vacation spot. I LOVE that tablecloth, and those darling glasses!! The whole table is just perfect. I want to come sit and dine and chat with you!! It’s a very happy table. And your room is fabulous! What a happy color combination, Dawn! The green and yellow is just so pretty. 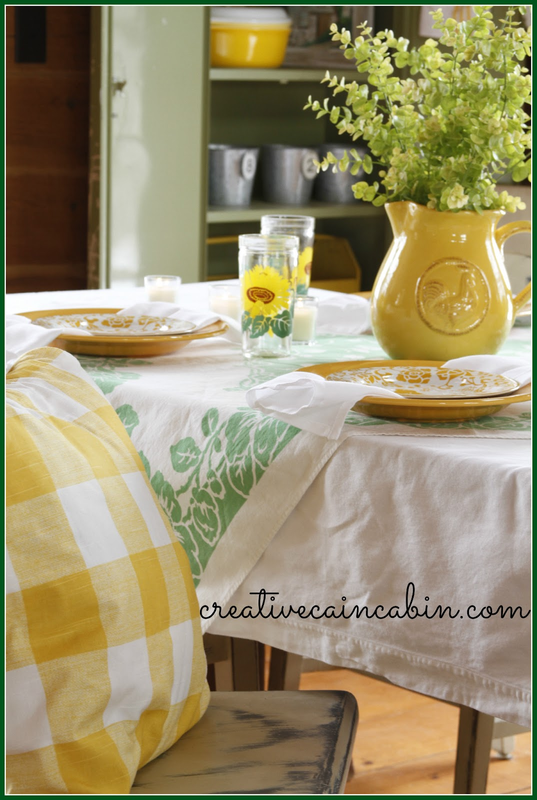 Especially love the green and white tablecloth, the bird plates and the yellow checked pillow! So sweet Dawn! I love everything about it. Happy St. Patrick’s Day to you too! Home is where your heart says Ahhhhhhh…..! Hi Dawn! 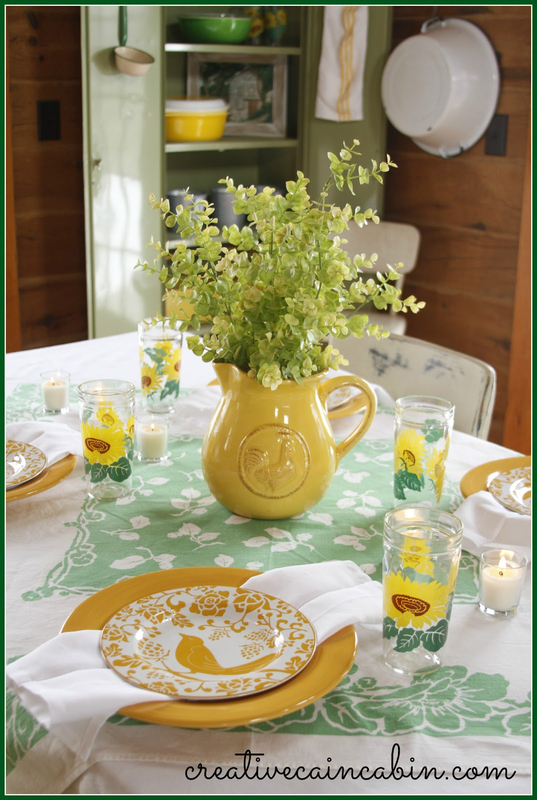 I love your Springtime table setting. Your vintage mint green table cloth and all your dreamy yellow touches. Your home is so inviting…so warm and friendly! So pretty! This could just be spring, period…with or without St Pats. I don’t really do anything for St Pats but one or two of my sons will surely be celebrating next weekend with some beer, I know that 🙂 My youngest is getting a ‘party bus’ together with friends to celebrate his birthday ( today ) and St Pats together in Pittsburgh next weekend down in the Strip District there. We were lucky to get a hotel room reserved for them / evidently they fill up quickly on St Pats weekend! Your table is wonderful, Dawn! 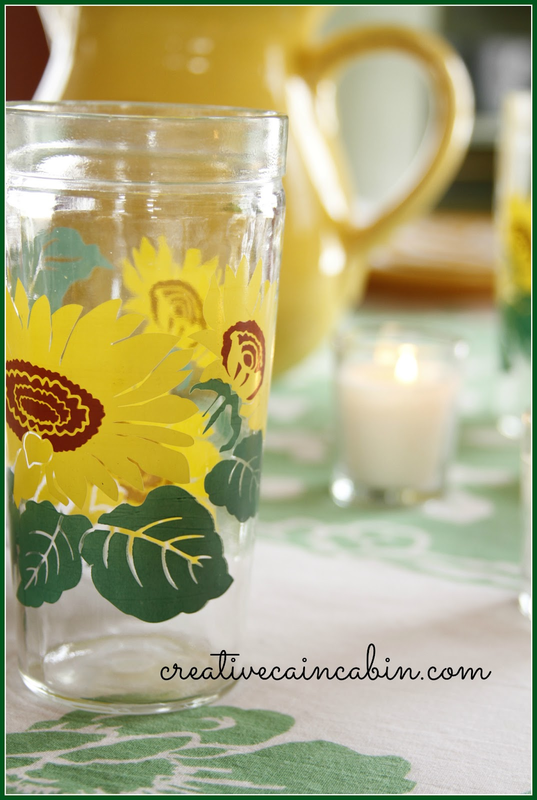 You know I adore those bird plates, and now I’m crushing over those sunflower water glasses! It all looks very Spring-like! So bright and cheery! I love that you used what you had on hand. It’s so much more welcoming. One day, I’d love to come and sit in your kitchen and drink it all in! 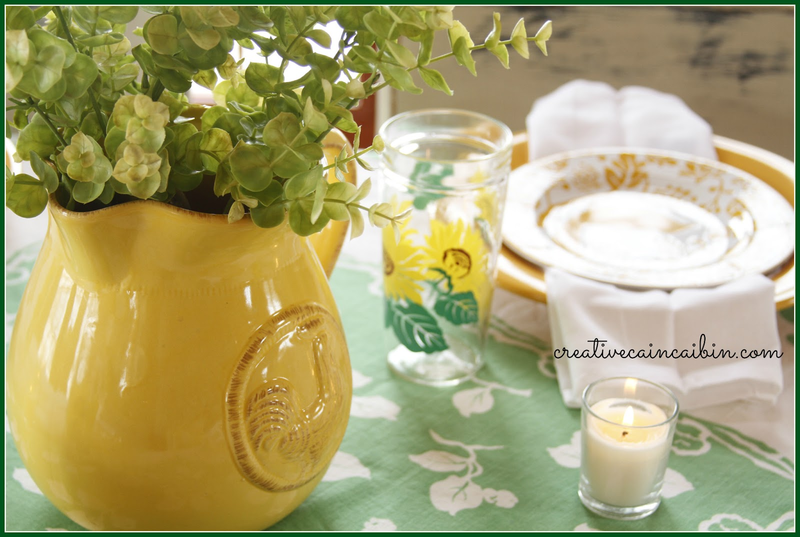 This is spring all contained in one yellow and green vignette! Beautiful! I love, love, love the bright and fresh colors you used here, Dawn. Such a pretty table! Such a pretty tablescape. I’m trying to get one together, but know if I’ll get it done in time. Happy St. Pat’s to you! Just stumbled onto your blog, and I have enjoyed it so much! 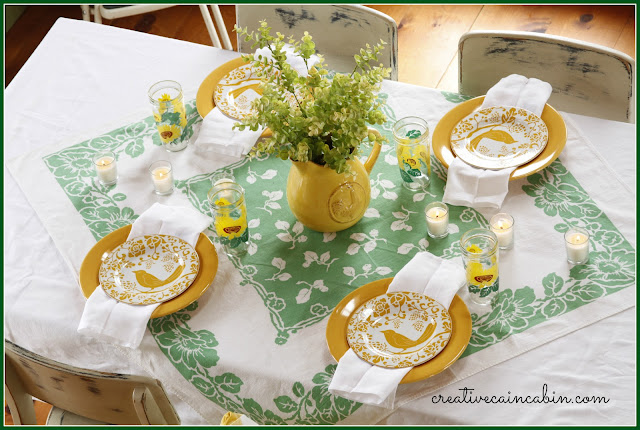 The St. Patrick’s Day tablescape is beautiful, and I see something that I had totally forgotten about from my childhood — the green and yellow glasses on the table!! We had so many of those when I was a little girl; I believe that jelly came in them (big jars of jelly). Back then, jelly jars were nice and large and made wonderful ice tea glasses when all the jelly was gone. Thank you for this wonderful memory! It looks wonderful. I love that you “shopped” the house. I always love your table settings. You just have a knack for putting the right items together!